How would astronauts cope with the prolonged isolation associated with a manned mission to Mars? 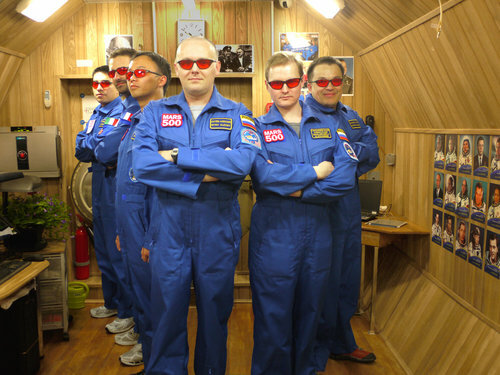 This was one of the many questions Mars500 sought to answer when they embarked on their simulated mission to Mars on June 3 2010, around 17 months ago. Now, on November 4 2011, after 520 days of isolation, the six man crew of Mars500 will open their hatch to the eagerly awaiting public. These brave men have made history and helped increase our knowledge of the human psyche and our ability to cope with long missions to extraterrestrial bodies. The spacecraft's crew is led by 38 year old engineer Alexei Sitev, and also includes Russian surgeon Sukhrob Kamolov, 32, and Russian general practitioner Alexander Smolevsky, 33. Non-Russian crew members include Italian Diego Urbina, 27, China's Wang Yue, 27, and the Roman Charles from France, 31. And so what did they find? According to the European Space Agency's (ESA) human life sciences specialist, Patrik Sundblad, the most important discovery is that "Yes, the crew can survive the inevitable isolation that is for a mission to Mars and back. Psychologically, we can do it." He goes on to say that the crew responded to the prolonged isolation better than anticipated. Throughout the simulation the crew has "monitored their brains, scanned their bodies, given all sorts of samples and maintained their habitat." (ESA) There will be further tests on the crew upon departure from their 'spacecraft', but there does not seem to be any major issues. One essential ingredient to success of Mars500 has been the international cooperation on the experiment. "China, Russia, and Europe," all of which have crew aboard Mars500, "have maintained the integrity of the unique experiment." (ESA) As Patrik states, "This is a very important lesson for any future mission to Mars: it is not only about the spacecraft and its crew, but also about close cooperation on Earth between all the teams and the international space agencies.” The crew needs regular communication with mission control on Earth to maintain proper trajectory and receive essential information. August was the mental low point [of the Mar500 experiment]: it was the most monotonous phase of the mission, their friends and families were on vacation and didn’t send so many messages. The crew morale went back up when communication with their friends and families increased to normal levels. If there was to be an emergency situation on the ship, communication from Earth could also be essential to survival of the crew, as was the case with the infamous Apollo 13 mission. The lessons learned from Mars500 will help any future manned mission to Mars (or any extended mission). In fact, after all tests and data have been analyzed, there may be a joint Euro-Russian manned mission to Mars in the works. [See Europe and Russia Pledge to Send Man to Mars]. Be sure to watch the hatch open live on Nov 4 at 1100 CET (0600 EST). Click here to be directed to the ESA live feed, which will begin streaming at 1050 CET.